Marsh + Mane is a natural hair and lifestyle boutique selling products for Black women who do not chemically straighten their hair. Their mission is to provide an elevated beauty retail experience and to always provide a safe space for women to purchase products for their self-care routine. Owner, Jenea Robinson, a “product junkie” herself, spent a lot of time in beauty supply stores, but was never pleased with the experience or the retail spaces. “The products are sold to you by people who know nothing about the products–they’ve never used them–you’re not allowed to touch and feel them, so you’re doing research online before you get to the store and really guessing on trying to find something,” she explained. Her concept of creating a beauty supply store that was an inspiring, beautifully designed space, with a welcoming environment, impeccable customer service and well-educated sales associates is what has now become Marsh + Mane. With a background in communications and public relations, along with consulting entrepreneurs and trusted advisors in her circle, Robinson presented a strong business plan to the Small Business Administration. 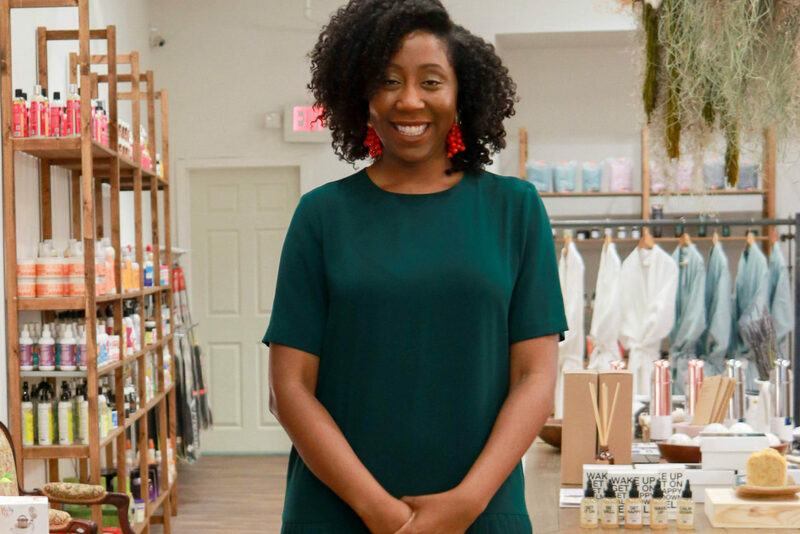 These resources were available to her through the City of Philadelphia Small Business Association Business Services, who assisted her in finding capital to bring her idea into fruition. However, one of the biggest challenges for starting the business was finding the location. She knew she wanted to be within the city, during her search she stumbled across her current location on 4th Street near South Street. Robinson is determined to thrive in the location, especially after her exceptional experience with the building owners at her South Street location. She found that they were excited about her idea, welcoming and inclusive of her, while also understanding of the experience she wanted to create for her customers, and interested in the potential customers she could bring to the area. Marsh+Mane is a place to visit to sit, relax, talk with other women about hair and skin care, gain education by associates and look at multiple product options. The experience of the customer is vital to Robinson’s mission. Expect to be greeted with a smile, music playing from Solange to SWV, good scents, sweet teas and just a good time. The boutique carries selections of hair creams, bath and body products, skin care, lifestyle goods, gift items, lotions, butters, shampoo and conditioners, body soaps, plant-based feminine care lines, hair balms, and even a section for men with beard and skin care products. Robinson and the sales associates try all of the products on the shelves to make sure that they can share their personal experience, and customers can also sample select products. With many brands and products out there, Robinson wants women to be able to get great quality, affordable products all in one place. As an advocate for healthier alternatives to beauty, Marsh + Mane consciously selects and supplies products that avoid harmful ingredients and chemicals. “A lot of ingredients that are in chemical relaxers that we put in our hair, those are bad for you, you can choose to wear your hair like that, and that is fine! But we can straighten our hair without those chemicals and that is part of the education we want to give to people,” says Robinson. There is a moss-like art installation hanging from the ceiling, which is representative of the meaning behind the boutique’s name. The name was creatively derived by Robinson who has family near the Chattahoochee River in the South where there are swamp-like areas, and she wanted to pay homage to that connection that Black women have to their roots and their hair.